3 years BA (Hons.) in Social Work with specialisation in Rural Development degree at TISS Tuljapur Campus. TISS Campuses and Intake/ seats in each campus. The total seat intake for BA Social Science is 50 for BA (H) Social Work is 30. The seats offered for the different course in different campuses of TISS is given in the table below. Candidate should be less than 23 years of age while appearing for the TISS BAT 2018 Exam as on 30 April 2018. Application forms of the candidates over this age will not be entertained. Candidates can choose only one campus in the online application. No transfers are permitted between the campuses. The candidate should have passed Class 12 or Intermediate in any subject stream from the recognised board. The result awaiting candidates of Class 12 or Intermediate are also eligible to apply for TISS BAT. However, the result awaited candidates if selected need to produce the documentary proof of passing the Class 12 or Intermediate at the time of joining. Candidates can apply for the programme only through an online process by visiting the official website. Candidates should fill the application form and submit it online by 19 March 2018. The candidates can apply to this programme on any one campus only. The details to fill the application process is given below. Candidates are expected to apply through the E-application. Requests received without the above Certificates will be rejected and no communication will be sent in this regard. For more detailed information on TISS BAT application process, the candidates should click the link given below. TISS BAT 2018 Admit Card is available for download from the official website of Tata Institute of Social Sciences and on the link is given below from 23 April 2018. Tata Institute of Social Science Admit card 2018 will not be dispatched through Post. TISS BAT 2018 Admit Card is available on the official website only for those eligible candidates who have submitted their duly filled application form ONLINE before the due date. An admit card is an important document to be carried at the examination centre. Note: In a case of payment by cash deposit in an SBI branch, the candidates will have to pay the extra charge of Rs 50. TISS BAT 2018 Result would be declared on 25 May 2018 and would reach candidates on e-mail. After the results of the exam have been declared, a cut-off list will be released for students. Students having the rank within the cut off would be given admissions. Similarly, second and third cutoff lists are provided below. The entrance test will be of 90 minutes duration and the total marks will be 100. The complete pattern of the TISS BAT Stage 1 exam pattern is given in the table below. The candidates are required to go through the table below. BASW has the second stage of selection in the admission process. Shortlisted candidates in the merit list for all categories will be called for a Personal Interview (PI) tentatively during June 2018 at Tuljapur campus. Final Selection: Candidates who score well in PI will be ranked on the BAT score and the PI score category wise and then selected for the programme. Pursue Masters’ programmes offered by the same campus, based on certain laid out criteria without any entrance test. Students who have taken admission in BA Hons Social work and want to pursue masters at TISS will have to appear for the entrance test. It is compulsory for the candidates to attempt both the parts in Stage 1. Both Part A & Part B will have separate cut off marks for evaluation in Stage 1. 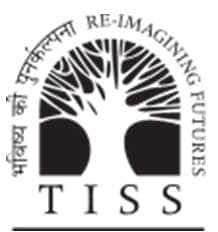 The Tata Institute of Social Sciences (TISS) was established in 1936, as the Sir Dorabji Tata Graduate School of Social Work.Tata Institute of Social Sciences is a social sciences institute with its main campus based in Mumbai, India. TISS Mumbai conducts several Masters, M.Phil and PhD programmes. TISS Mumbai does not offer Undergraduate programmes. TISS also operates out of campus in Hyderabad, Guwahati and Tuljapur and offers an undergraduate degree programme. TISS Guwahati- 66% of the seats will be proportionately distributed amongst the eight North-eastern States (seats allocated to each of the states will follow the reservation norms of that State); and 34% of the seats for students from rest of India. TISS BAT 2018 Test Centres are spread in different states throughout India. The candidates can choose the test centre as per their convenience from the given list and mention the same in his/her TISS BAT 2018 Application Form. There are total 22 test centres arranged for the TISS BAT exam. The candidates are advised to follow the link given below to get the complete list of the test centres.